​I have never made Gingerbread cookies before and I decided that this year was the year to start! Most of my yummy recipes that I LOVE come from Williams-Sonoma and that is where I found this one! These cookies are exactly what I wanted them to be. 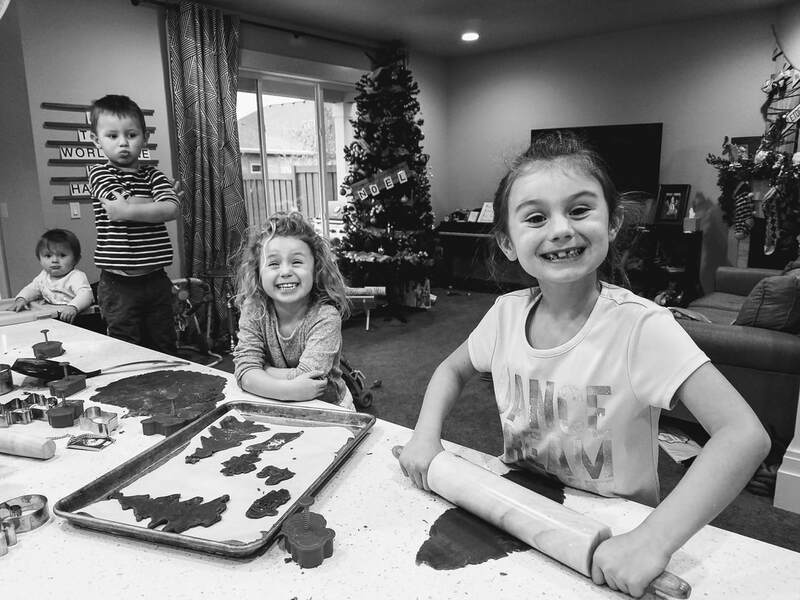 The dough is easy to work with, the cookies were soft & flavorful and the kids had a blast making them! The cookie dough needs at least 2 hours in the refrigerator before you can roll them out! I started making mine on a Sunday evening hoping to make the cookies that night and saw that direction a little late! The great thing about this cookie dough is that you can make it ahead of time and keep the dough in the refrigerator until you're ready to make them. Also, make sure that you don't roll your dough out too thin and check on the cookies at 8 minutes! Both of these tips will ensure that your cookies are perfectly cooked! ​In a large bowl, using an electric mixer, beat the butter on high speed until fluffy and pale yellow. Add the brown sugar and granulated sugar and beat until the mixture is no longer gritty when rubbed between your finger and thumb. Reduce the speed to low and gradually beat in the molasses. Add the egg and beat until the mixture is blended. Sift the flour, baking soda, ginger, cinnamon, cloves and salt together onto a sheet of waxed paper. Gradually add the flour mixture to the butter mixture, beating on low speed or stirring with a wooden spoon until well blended. Turn the dough out onto a floured work surface and, with floured hands, form into a large, smooth mound. Divide the dough into 4 equal portions, shape into disks and wrap each disk in plastic wrap. Refrigerate for at least 2 hours or up to 2 days. Preheat an oven to 400°F. Lightly grease 2 baking sheets or line them with parchment paper. Working with 1 disk at a time, roll out the dough between 2 sheets of waxed paper to a thickness of about 1/4 inch. Using gingerbread cookie cutters 3 to 5 inches tall, cut out figures. Using an offset spatula, transfer the cookies to a prepared baking sheet. Repeat with the remaining dough portions, then gather up the scraps and reroll them. If the scraps of dough have become sticky, refrigerate them for 10 minutes before rerolling. For best results, do not roll the same piece of dough more than twice. Bake the gingerbread figures until lightly browned on the bottom, about 6 minutes. Let cool on the sheets for 5 minutes, then transfer the cookies to wire racks and let cool completely. Dress up the cooled gingerbread figures with the royal icing, sugars and other decorations. Makes 2 to 5 dozen cookies, depending on size. Adapted from The Williams-Sonoma Baking Book, Edited by Chuck Williams (Oxmoor House, 2009). ​​I would love to say that I have a beautiful picture of finished decorated cookies, but we ate them all before we really even got the icing on! I hope you enjoy this recipe as much as we did! For your convenience I have the recipe below in a more printable format. Here I hope to share fantastic recipes that my family enjoys and I hope yours will too!